UNITED NATIONS, Oct 6 2012 (IPS) - It was early July 2004, and Darfur was looking like a war zone – massive human displacements of an estimated one million people, ongoing skirmishes, inclement weather, a parched landscape due to the recurring droughts, and sheer misery everywhere. The worst affected were women and children. Each passing day, the agony and suffering we witnessed was heartbreaking. There was an urgent need to quickly immunise all children in Sudan, and this included Darfur, to prevent polio, a life-threatening and crippling disease, which loomed ominously on the horizon. 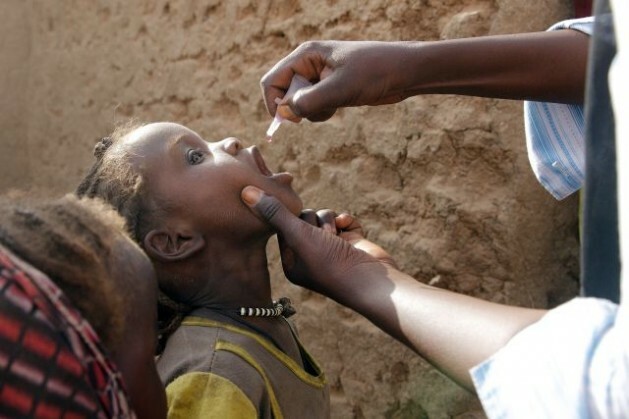 In June 2004, the Global Polio Eradication Initiative (GPEI) led by WHO, Rotary International, U.S. Centres for Disease Control and UNICEF warned that the polio virus was spreading at an alarming rate across West and Central Africa. In May 2004, it was confirmed that a child was paralysed by polio in Darfur. This was a complex emergency; a simmering conflict, combined with hunger, malnutrition, lack of access to clean water, sanitation, health and other basic services made survival itself a challenge. It was in these circumstances that UNICEF and WHO in Sudan along with important NGO partners started planning with local authorities on how best to immunise all children in Darfur. Saving lives and mitigating the suffering of these affected populations scattered over the three states in Darfur was included in a joint response plan that was being developed. The overarching issues remained addressing the rights and the humanitarian needs of vulnerable populations and groups, irrespective of their political status or differences. Most importantly, it was about giving children and their mothers the best possible start in life, building their resilience and addressing their basic needs, despite the enormous challenges around them. Safety of all staff, international and local was paramount. The local rebel factions that were operating in Darfur refused to allow vaccinators to enter the areas they controlled. The ongoing conflict, absence of infrastructure, lack of adequate cold storage and the very high temperatures all posed formidable challenges for vaccination. In order for the immunisation campaign to succeed, we needed to include all stakeholders in the planning process, especially to reach out to and involve the various rebel factions, who controlled many parts of areas inaccessible to our staff. With full knowledge of government counterparts, talks were initiated with the leadership of the different rebel groups. From the senior-most political leaders to the local commanders in the field, it was important to get everyone aligned on the importance of this initiative, as it was about the children in the areas they controlled or communities they came from. Following active engagement, negotiation and persuasion with the Sudanese government and non-state entities (rebel groups), a window of two weeks of cessation of hostilities was secured from all parties. Large numbers of staff were mobilised by WHO, UNICEF and the NGO partners to help with the campaign. This allowed multi-agency teams the opportunity to conduct a rapid assessment of previously inaccessible areas and develop a micro-plan for a ‘Polio plus’ campaign (polio vaccines with de-worming tablets and Vitamin A supplements) to improve child health and minimise under five-year-old mortality. More than 10,000 children under five years of age were reached in the rebel-controlled areas during the two vaccination rounds. Education and health kits were provided to these communities as part of the campaign in order to address the educational and health needs of children in the communities as well as provide a sense of normalcy under the very stressful conditions they lived in. At least 10 skilled staff in the recipient populations were trained to provide care and support. This was combined with a mass campaign of hygiene promotion with simple messages on hand washing and waste disposal to prevent diarrheal diseases. The polio immunisation campaign was the driver for a wider process of improving and ramping up assistance to communities and this made the campaign attractive to mothers to bring their children to the immunisation hubs that were established. To overcome some of the challenges of very poor infrastructure, large numbers of donkeys and camels were hired to ferry supplies, including cool boxes, to remote communities. The U.N.’s World Food Programme also assisted the initiative by providing helicopters which helped reach some of the most remote areas. The Global Polio Eradication Initiative (GPEI) had served as a bridge, an entry point and a disease control strategy for reaching the unreached and most vulnerable. The lesson learned is that it is possible to immunise children even in complex emergencies and conflict settings. Embracing the principles of neutrality, humanity and independence is fundamental to the success of these approaches, and willingness to negotiate with all parties is paramount. Finally, a critical aspect for success was not being risk-averse. The humanitarian imperative became the driver for social mobilisation and action to prevent polio. This campaign gave us an opportunity to not just scale up the immunisation programme but allowed us to address issues around child survival in Darfur. With resolve, leadership at global and country level, partnerships, commitment and alacrity, it is possible to eradicate polio forever everywhere, and soon. And health services may well serve as a bridge for peace in conflicts. *Siddharth Chatterjee is the Chief Diplomat and Head of Strategic Partnerships at the International Federation of Red Cross and Red Crescent Societies. He can be followed on Twitter at sidchat1. Dr. Sam Agbo is an independent public health advisor in the UK. Great work. Political will is key to ensuring polio eradication. This battle is winnable and can save so many lives. This is a story of hope. Children deserve a good start to life, despite the insecurity and poverty around them. Polio eradication is not a dream it is a reality but need to make sure that reality is carried out – support your government to continue the funding of polio eradication until every last child if free of polio – the economic benefits are huge but the humanitarian ones are an unbelievable legacy – forever! What behind this success story is also about effective partnerships to strengthen resilience and reduce vulnerability in the face of adversity — a principle that governments (donor and aid-recipient countries) and most of the development actors committed in the 4th High-level Forum on Aid Effectiveness in November 2011 in Busan. Health is often the only “economic & development” asset for the poor and the most vulnerable. This story about polio prevention in Darfur in 2004 during conflicts, through partnerships with a coordinated and complementary approach for enhanced service delivery, is a perfect example to show case what effective partnerships can achieve as outcome on the ground. What an incredible accomplishment. This can easily be repeated in Pakistan, Afghanistan and Nigeria. As the authors suggest,”With resolve, leadership at global and country level, partnerships, commitment and alacrity, it is possible to eradicate polio forever everywhere, and soon.” I really hope the world comes together and eradicates polio. I have seen people in my own family affected by polio.